Seth Klarman’s 13F portfolio value increased from $10.37B to $11.44B this quarter. Baupost Group increased Twenty First Century Fox while decreasing Cheniere Energy. The portfolio continues to be heavily concentrated with the top three positions accounting for ~40% of the 13F portfolio. This article is part of a series that provide an ongoing analysis of the changes made to Baupost Group's 13F stock portfolio on a quarterly basis. It is based on Klarman’s regulatory 13F Form filed on 08/13/2018. Please visit our Tracking Seth Klarman’s Baupost Group Holdings article for an idea on how his holdings have progressed over the years and our previous update for the fund's moves during Q1 2018. Baupost Group’s 13F portfolio value increased ~10% from $10.37B to $11.44B this quarter. The total number of 13F securities remained steady at 31. 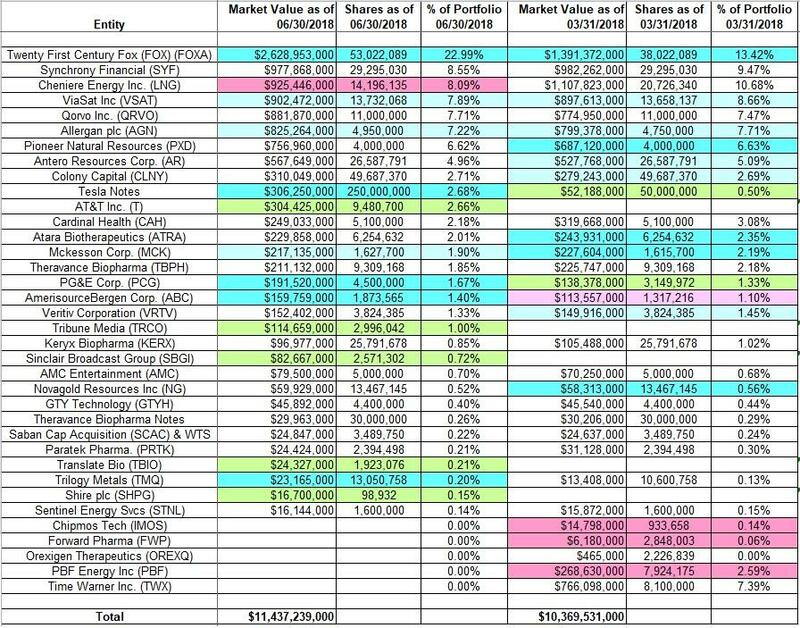 The portfolio is heavily concentrated with Twenty First Century Fox, Synchrony Financial, Cheniere Energy, ViaSat Inc., and Qorvo together accounting for ~55% of the 13F holdings. Since inception (1982), Baupost Group’s 13F portfolio has accounted for between 2.4% to 15% of the Assets Under Management (AUM). The current allocation is at the high-end of that range. The rest of the AUM is diversified among cash, debt, real estate, and hedges. The fund continues to hold well over a quarter of the AUM in cash. Seth Klarman’s distinct investment style is elaborated in his 1991 book “Margin of Safety: Risk-averse value investing strategies for the thoughtful investor”. The book is out-of-print and copies sell for a huge premium. AT&T Inc. (T): The 2.66% T stake came about as a result of the acquisition of Time Warner by AT&T. Baupost had a large merger-arbitrage stake in Time Warner established in Q4 2017. In October 2016, AT&T (T) agreed to acquire Time Warner in a cash-and-stock deal valued at $107.50 per share (half cash). That transaction closed in June. Tribune Media (TRCO) and Sinclair Broadcasting (SBGI): These are small (less than ~1% of the portfolio each) new stakes established this quarter. The ~1% TRCO position was purchased at prices between $35 and $41 and the stock currently trades just below that range at $34.62. SBGI is a 0.72% portfolio stake established at prices between $27 and $33.50 and it is now near the low end of that range at $27.90. For investors attempting to follow Baupost, these two are good options to consider for further research. Translate Bio (TBIO) and Shire plc (SHPG): These are minutely small (less than ~0.2% of the portfolio each) positions established this quarter. Note: Regulatory Fillings since the quarter ended show them owning 6.5M shares of Translate Bio (14.5% of business). That is compared to 1.9M shares in the 13F report. TBIO had an IPO in June. Its main asset is a compound to treat Cystic fibrosis (mRNA therapy) acquired from Shire plc. PBF Energy (PBF): PBF was a 2.59% of the 13F portfolio position first purchased in Q3 2013 at prices between $21 and $26. It was more than doubled the following quarter at prices between $21.50 and $31.50 and was increased by over 175% in Q1 2014 at prices between $24 and $31.50. The stake had since been doubled through periodic buying. Q3 2016 saw another ~50% increase at prices between $21 and $24. There was an about-turn in Q4 2017: ~30% reduction at prices between $26 and $36 and that was followed with a similar selling last quarter at prices between $29 and $36. The disposal this quarter was at prices between $33.50 and $51. The stock currently trades at $47.36. ChipMOS (IMOS), Forward Pharma (FWP), and Orexigen Therapeutics (OTCPK:OREXQ): These three minutely small (less than 0.5% of the portfolio each) stakes were disposed this quarter. Note 1: Following settlement of a lawsuit with Biogen (BIIB) that netted $1.25B, FWP shareholders received $23.13 per share as a special dividend last year. Note 2: Following Orexigen’s Chapter 11 bankruptcy in March, Baupost was involved in a $35M DIP (debtor-in-possession) loan facility related transaction. Previously, they were involved in other capital raise transactions. Twenty First Century Fox (FOX) (FOXA): FOX is currently the largest position at ~23% of the portfolio. It was established in Q3 2015 at prices between $25.41 and $33.52 and increased by ~40% in Q1 2016 at prices between $24 and $28. H2 2016 also saw a two-thirds increase at prices between $24 and $29. Last two quarters had seen another ~43% increase at prices between $24.30 and $38.50. A similar increase happened this quarter at prices between $36 and $50. The stock currently trades at $45.32. Note: In December 2017, Walt Disney (DIS) agreed to acquire certain assets (excludes Broadcasting network and stations, Fox News, Fox Business, FS1, FS2 and Big Ten Network) from Twenty First Century Fox in an all-stock deal (0.2745 shares of DIS per FOX share). ViaSat (VSAT): VSAT is a large (top five) position at ~8% of the portfolio. The stake has only seen minor increases since Q3 2012. Klarman first purchased VSAT in 2008 at much lower prices and his overall cost-basis is in the high-teens. The stock currently trades at $62.52. Q4 2016 saw a ~14% increase at prices between $66 and $81. He is sitting on huge gains on the position. There was a ~4% increase last quarter and a marginal further increase this quarter. Note: Klarman controls ~23% of VSAT. Allergan plc (AGN): AGN is a large 7.22% of the 13F portfolio stake established in Q1 2016 at prices between $266 and $299. Q2 2016 saw a ~16% increase at prices between $202 and $278. There was another ~70% increase in Q4 2016 at prices between $189 and $243. The pattern reversed in Q1 2017: almost 30% sold at prices between $210 and $250. The stock currently trades at $184. Q3 2017 saw a ~22% stake increase at prices between $202 and $256 and that was followed with a ~50% increase the following quarter at prices between $164 and $211. For investors attempting to follow Baupost, AGN is a very good option to consider for further research. Last quarter saw a ~6% increase and that was followed with a ~4% increase this quarter. PG&E Corporation (PCG) and Tesla Notes: These two new positions established last quarter saw increases this quarter. PCG is a 1.67% stake established last quarter at prices between $38 and $45 and increased by ~43% this quarter at prices between $39 and $47. The stock currently trades at $42.79. The 2.68% position in Tesla Notes saw a 400% increase this quarter. Note: PG&E shares dropped sharply in December as they halted the dividend citing liability concerns from the October 2017 Northern California wildfires. Following that, several hedge funds (Abrams, Tepper, Loeb, Romick, etc.) added PG&E shares to their portfolios. McKesson Corp. (MCK): MCK is a ~2% portfolio stake established in Q3 2017 at prices between $146 and $168 and increased by ~170% in the following quarter at prices between $135 and $163. The stock currently trades below those ranges at $126. For investors attempting to follow Baupost, MCK is a good option to consider for further research. There was a ~19% stake increase last quarter at prices between $139 and $177 and that was followed with a marginal increase this quarter. Note: MCK had a previous round-trip. It was a 1.75% portfolio stake established in Q4 2016 at prices between $124 and $167 and sold out in Q2 2017 at prices between $135 and $168. AmerisourceBergen (ABC): ABC was a minutely small position established in Q3 2017. It was built to a 1.30% position next quarter at prices between $73 and $94. The stock is now at $83.06. There was a ~8% trimming last quarter while this quarter saw a ~42% increase at prices between $82.50 and $95. Trilogy Metals (TMQ): The minutely small 0.20% stake was increased by ~40% this quarter. Note: Baupost controls ~14% of Trilogy Metals. Cheniere Energy (LNG): LNG is Klarman’s third-largest 13F position at ~11% of the portfolio. The original stake was established in Q1 2014 at prices between $41 and $55. In H2 2014, it was doubled at prices between $62 and $84. The three quarters thru Q1 2016 saw another stake doubling at prices between $24 and $71. Q4 2016 saw a reversal: 22% sold at prices between $35.50 and $43.50 and that was followed with a roughly one-third reduction this quarter at prices between $53 and $69. The stock currently trades at $63.54. Note: Baupost controls ~5.7% of Cheniere Energy. Synchrony Financial (SYF): SYF, the November 2015 spinoff from General Electric (GE) is now the second-largest position at 8.09% of the portfolio. It was established in Q3 2016 at prices between $25 and $28.50. Q2 2017 saw a two-thirds increase at prices between $26.50 and $34.50. The stock currently trades at $29.19. Qorvo Inc. (QRVO): QRVO is a large (top five) 7.71% portfolio stake established in Q1 2017 at prices between $53 and $69 and increased by ~25% the following quarter at prices between $63 and $79. There was another ~22% stake increase in Q4 2017 at prices between $65 and $81. The stock is now at $83.11. Note: Baupost controls ~9% of the business. Pioneer Natural Resources (PXD): PXD was a minutely small stake established in Q3 2017. The position was built up to a 3.42% portfolio stake in Q4 2017 at prices between $142 and $174. There was a stake doubling last quarter at prices between $165 and $189. The stock is now at $183. Antero Resources Corporation (AR): AR is a fairly large ~5% of the portfolio position established in Q3 2014 at prices between $54.50 and $66. The stake was increased by ~185% the following quarter at prices between $38.50 and $55.50. Recent activity follow: Q2 2016 saw a one-third reduction at prices between $24.50 and $30 while Q2 2017 saw a ~45% increase at prices between $19.50 and $22.50. The stock currently trades at $17.92. Last three quarters had seen a combined ~25% stake increase at prices between $17 and $22. Note: Klarman controls ~8% of the business. Colony Capital (CLNY): The 2.71% stake in Colony Capital came about as a result of the three-way merger of Colony Capital (CLNY), Northstar Asset Management Group (NSAM), and Northstar Realty Finance (NRF) that closed in January last year. Baupost held stakes in all three of these stocks and those got converted into CLNY shares. They control ~10% of CLNY and their overall cost-basis is ~$12.50 per share. CLNY currently trades well below that at $6.12. For investors attempting to follow Baupost, CLNY is a good option to consider for further research. There was a ~4% stake increase last quarter. Cardinal Health (CAH): The ~2% CAH position was purchased in Q4 2016 at prices between $65 and $78 and almost doubled in Q2 2017 at prices between $71.50 and $83. There was another ~25% increase the following quarter at prices between $64 and $79 and that was followed with a stake doubling in Q4 2017 at prices between $55 and $68. The stock currently trades near the low end of those ranges at $49.06. For investors attempting to follow Baupost, CAH is a good option to consider for further research. Atara Biotherapeutics (ATRA): ATRA is a ~2% of the portfolio stake established in Q4 2014 at around $19 per share. In Q1 2015, the stake was increased by ~90% at prices between $18 and $42.90. The stock currently trades at $37.80. There was a ~17% stake increase last quarter at prices between $18 and $48. Note: Klarman controls ~15% of the business. Theravance Biopharma (TBPH): TBPH is a 1.85% of the portfolio position established in Q2 2014 as a result of the spinoff of TBPH from Theravance (now Innoviva). The spinoff terms called for Theravance shareholders to receive 1 share of TBPH for every 3.5 shares of Theravance held. The original stake was increased by ~5% in Q1 2015 at prices between $14.50 and $22. Q2 2016 saw another ~13% increase at prices between $17.50 and $24. The stock is now at $28.17. Q4 2016 also saw a ~25% increase at prices between $24.50 and $38.50. Note: Klarman controls ~19% of the business. Veritiv Corporation (VRTV): VRTV is a 1.33% of the 13F portfolio position established in Q3 2014 at prices between $32.50 and $50.50. Q4 2017 saw a ~20% stake increase at prices between $22.50 and $32.50. The stock currently trades at $46.60. There was a ~5% stake increase last quarter. Note: Klarman’s ownership interest in VRTV is ~25%. Keryx Biopharma (KERX): KERX is a 0.85% of the portfolio position established in Q1 2014 at prices between $12 and $17. Q2 & Q3 2014 saw the position more than doubled at prices between $12.50 and $18. H1 2015 had also seen a ~40% further increase at prices between $9.50 and $14.50. The stock currently trades well below the low-end of those ranges at $3.13. Klarman’s cost-basis is at around $12. Note: Keryx is merging with Akebia Therapeutics (AKBA) in a transaction announced in June. KERX shareholders will receive 0.37433 common shares of AKBA for each share held. Baupost agreed to redeem their convertible notes at an effective conversion price of $4.17 (39.6M shares – outlay was $164.75M). Overall, the current ownership will amount to a stake of 24.48M shares (21.1% of business) in the combined business. It is based on 116M shares projected to be outstanding. Note: Baupost has a ~9% ownership stake in the business. NovaGold Resources Inc. (NG): The very small 0.52% long-term stake in NG saw a ~13% increase in Q4 2017 at prices between $3.40 and $4.25 and another ~25% increase last quarter at prices between $3.60 and $4.70. The stock is currently at $4.31. Sentinel Energy Services (STNL): STNL is a SPAC established by former executives of Schlumberger (SLB) to acquire an underperforming energy services business. The minutely small 0.14% stake was acquired in Q4 2017. Paratek Pharmaceuticals (PRTK): PRTK is a minutely small 0.21% position that saw a ~17% increase in Q2 2017 at prices between $18.50 and $25.50. The stock is now at $9.65. Note: Baupost Group controls ~9% of Paratek Pharmaceuticals. GTY Technology (GTYH) and Saban Capital Acquisition Corp. (SCAC): These are very small (less than ~0.5% of the portfolio each) stakes kept steady this quarter. Note 1: Baupost controls ~9% Saban Capital Acquisition and ~8% of GTY Technology. Note 2: The 13F also lists a small position in Theravance Biopharma Notes. Disclosure: I am/we are long AGN, AKBA, AR, CLNY, GE, KERX, LNG, NG, PRTK, TBPH. I wrote this article myself, and it expresses my own opinions. I am not receiving compensation for it (other than from Seeking Alpha). I have no business relationship with any company whose stock is mentioned in this article.